With a peculiar microclimate with great thermal oscillations and high rainfall, our varieties of picuda, hojiblanca and picual olives are cultivated, although the dominant picuda propitiates that our oils are very aromatic. They are oils with a lot of body and great personality, in which the fruity taste of green olive with notes of green almond and olive leaf are noted. All of them share an excellent quality, possess antioxidant capacities and are rich in monounsaturated fatty acids. One of the healthiest foods, essential in any healthy diet. Juice squeezed from the fruit of the olive tree, the olive. Product obtained only and exclusively by mechanical procedures, at the optimum moment of maturation of the olive. It is the most natural of all oils, without additives or preservatives. It is an oil of supreme quality, intense flavor and excellent aroma. A real delight for the senses. Oil obtained directly from the olives only by mechanical procedures, controlling the thermal conditions so that their properties are not altered. 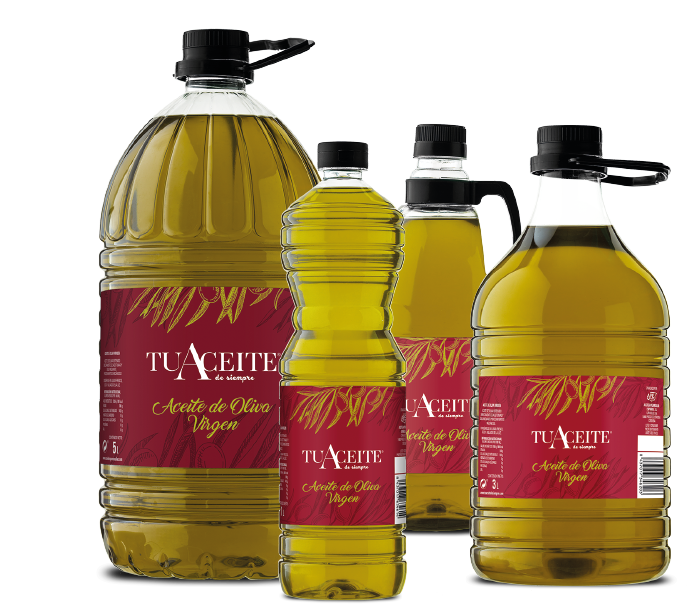 TuAceite de Oliva Virgin has different aromatic nuances and an intense and deep flavor, thanks to the combination of oils from our different varieties of olives. In the kitchen, it becomes the ideal ingredient to enhance the personality of any dish, giving it a traditional and natural touch. 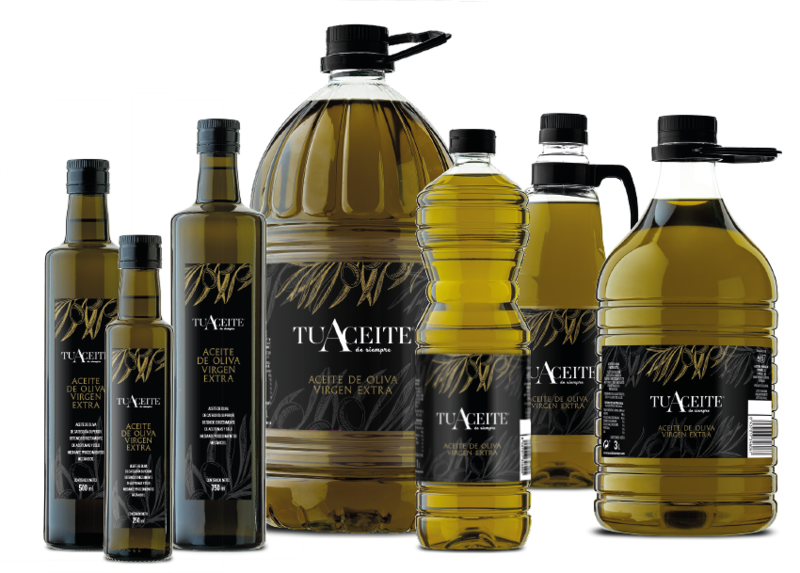 Oil containing exclusively olive oils subjected to a refining treatment and oils obtained directly from olives. TuAceite de Oliva is presented with two intensities of flavor. One brings an exquisite touch to all recipes for its intense taste and enhances the flavors of a healthy and natural cuisine. Softer on the palate and with a slightly less dense texture, it is ideal for frying and cooking daily. It offers an outstanding result when used in stews, fried foods and dressings. Due to its neutral and soft flavor it is also used in the preparation of sweets and biscuits. Excellent for the whole family for its pleasant taste. Fruit of the refined oil, enriched with virgin and extra virgin olive oils that give it its flavor, color and aromas. Like our olive oils, it has many health benefits and is of similar energy contribution. As it is rich in oleic acid, its consumption reduces cholesterol levels, also has a high content of natural antioxidants, such as chlorophyll, vitamin E and carotenes.